Are you unhappy with the current state of your bathroom? Are you looking to get your bathroom remodeled but have no idea where to start? We’ve compiled a Lefroy Brooks review for you to get jump started on your next home improvement project. Lefroy Brooks faucets and bathroom fixtures will give your bathroom the cutting edge style and functionality that will make your life easier and more enjoyable every day. You spend every day in your bathroom, and during that time spent, you’re using your bathroom faucet more so than almost any other asset of your house. You want to make sure turning on your faucet is effortless but also fun. 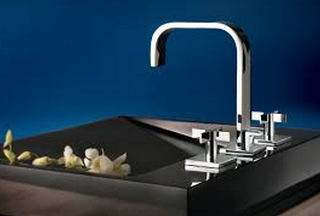 If you don’t like the current design of your faucet and fixtures, make an easy transition to Lefroy Brooks products. They have modern, high-end bathroom fixtures that will give your bathroom a nice finishing touch. You’ll be excited to get up every morning and start your routine with Lefroy Brooks! Not only does Lefroy Brooks offer stylish bathroom faucets, they also have bathroom lighting, bathtubs, showerheads, toilets, taps, mirrors, cabinets, radiators, soap dispensers, and more! There’s so many options to choose from, whether you want to completely revamp your bathroom, or simply add a few adjustments here and there. Lefroy Brooks has made it easier than ever to get a modern look and quality you deserve. There are a numerous products and styles to choose from, but no matter what you’re guaranteed to have the best products available on the market. There are also classical looks available if you want to give your home a Victorian or Deco feel. The options are endless! At PlumbTile you’ll save money on these Lefroy Brooks products, so there’s even more incentive to start your remodeling project sooner rather than later! Get up close and personal with your personal vanity mirror. We understand that bathroom mirrors sometimes just don’t get the job done when you’re trying to look closely at your face during facial shaving or applying makeup. Your bathroom sink will get in the way, and the constant leaning over can add strain to your back and neck muscles. 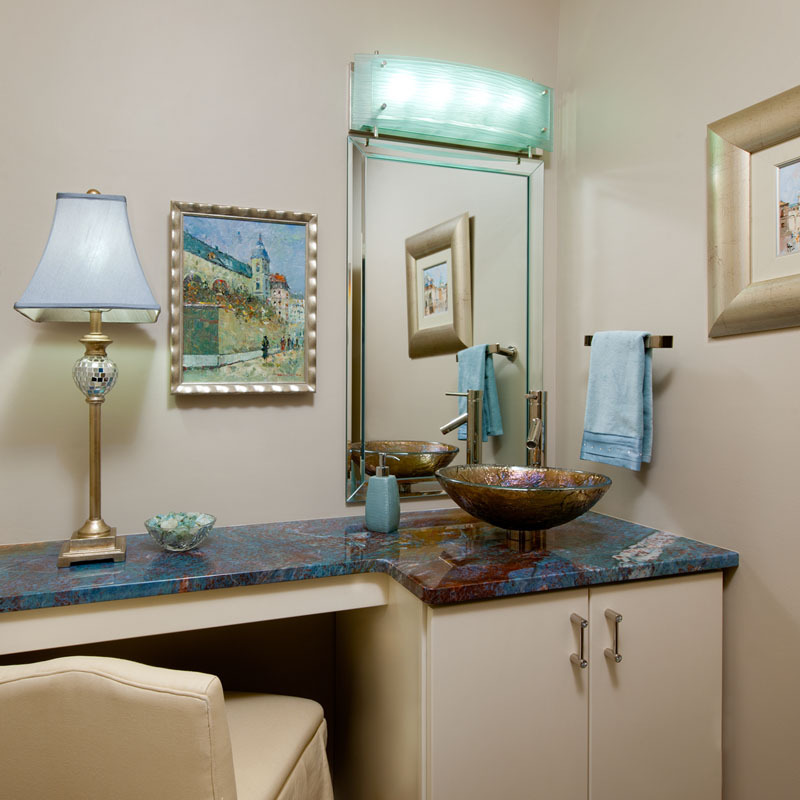 But your daily vanity routines can be as convenient as ever with a bathroom vanity mirror. Some of our favorite bathroom mirrors are made by French Reflection, look at our review below and see why French Reflection should be the newest addition to your bathroom counter! 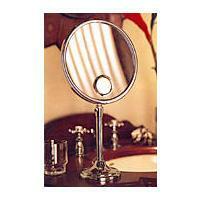 French Reflection offers some of the highest quality shaving and makeup mirrors on the market. French Reflection makes magnified mirrors so you can see even the most miniscule spots on your face. The magnifying mirror is free of distortion, so your face will look just the same as it does in a sink mirror, but with a zoomed in lens. Magnification lenses come in triple, five, and even seven-power close-ups. These mirrors won’t miss anything! And the other side of the vanity mirror will include a non-magnified lens so you can see yourself on a normal scale as well. Plus, some of their boutique mirrors have built-in lights to get the perfect image even in dim bathroom lighting. French Reflection mirrors come in all styles, shapes, and sizes. You can choose from multiple finishes such as titanium, gold, or chrome. They can come as wall attachments or stand on their own on a counter with the table stop style. These mirrors are great not only in the bathroom, but also your bedside, office, and home. Your shaving and makeup regimen will come out flawless every time with French Reflection vanity mirrors! Oftentimes, we take our kitchen faucets and bathroom faucets for granted. The kitchen and bathroom are two of the most important spaces in the house. We use them the most often and need their conveniences to pursue our daily endeavors such as cleaning, cooking, and washing up. And within our kitchen and bathroom, our faucets are at the source of these needs. We turn on our faucets every day and sometimes zone out their significance to our home. If you are always using your faucet, wouldn’t you want it to be as beautiful and functional as possible? Maybe a retouching on your faucets is just what you need! You’ll be happy to see how chic your new purchase is with every single use, every single day. A new faucet will be money well spent because you’ll enjoy the results every time you grab a glass of water, brush your teeth, clean your dishes, and so on! Now the only question remaining is, where do you purchase such lovely and functional kitchen and bathroom faucets? California Faucets offers state-of-the-art bathroom products in a variety of styles and finishes. You’ll be so entranced with the beauty of your new faucet each time you use California. Each faucet is hand-finished in California with the amount of care and attention you want in every product you buy. The craftsmanship will remain durable and strong throughout the years. Even the busiest chef will appreciate the reliability of California Faucets products and appliances. California Faucets also provides faucet fittings, shower systems, drains, trims, and accessories. No matter how picky your bathroom and kitchen needs may be, California Faucets guarantees to give you amazing products every time. If you don’t believe us, check out the numerous industry awards California Faucets has been awarded over the years! Even the professionals agree that they are a premier choice for kitchen and bathroom products. A clean and elegant finish to your flooring can make all the difference to the final look of a room. We’ve compiled an Eleganza tile review for this precise reason. We know you want your bathroom and kitchen tiles to look sleek for visitors, but also have a durable and lasting finish. Eleganza tiles will look perfect for the walls and floors of any kitchen or bathroom in your home. Eleganza tiles include a variety of colors and styles. Traditional home tiles are available, as are unique collections that don’t look like tiles at all! Eleganza offers tiles that look like both marble and wood for indoor surfaces. You’ll be able to have any look you want for your house, without the risk of spending too much money on marble surfaces, or worrying about wood surfaces getting scratched up or stained. These faux tiles keep you house looking good as new, and give it the modern touch you’ve always wanted, but without the hassle or expenses. All Eleganza tiles are made in Italy with the highest quality of treatment. Each tile is extremely durable and well made to suit any lifestyle you have. Do you have a lot of pets with claws that scratch up surfaces? Do your children spill pesky messes on the floor constantly? Are you always tracking in mud, rain, or snow into your home? Eleganza has the perfect solution for any of these messes. These tough and stain resistant surfaces can endure any wear and tear for years to come. Keep your home looking beautiful and bright around the clock with Eleganza bathroom tile and kitchen tiles. Guests will be amazed by how polished your new floors look, and you’ll be happy to know these tiles are easy to maintain too! 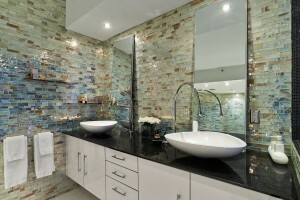 A remodeling of your bathroom tile or kitchen tiles can make a huge difference to the look and feel of your home. With some many ceramic tile trends on the market right now, it may be hard to choose which one is perfect for you. We’ve listed a few options to consider when you decide to initiate your next home improvement project. Always remember, your own personal style and preference is important to consider. You want to make your home unique and personal, and since there are so many ceramic tile options nowadays, the solution has been easier than ever before! 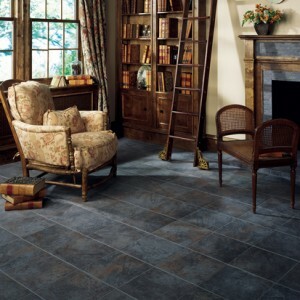 Gray has been the most popular color in tile trends. Clay, soft blacks, taupe, and other neutrals are also a common option in new bathroom and kitchen remodels. The neutral tones of these colors add a modern look to any area, and ensure any area looks clean and sleek. Wood is another neutral style that gives a cozy feel to any bathroom or kitchen. But wood can wear down and stain fairly easily. With a lot of pets or kids around, wood surfaces are susceptible to getting scratched and losing their quality quicker than a ceramic tile surface. Luckily, now you can retain a natural wood finish with ceramic tiles! These tiles trick you every time, but still remain clean and easy to manage like other ceramic tiles. Marble and granite tiles are also popular for wall and counter surfaces in kitchen and bathrooms, but they can be expensive to purchase. Give your home the elegant style it deserves with a ceramic tile finish that looks just like thick slabs of marble. These tiles will brighten up a room without burning a hole in your pocket. Plus, they’re easy to clean and fun to show off at your next dinner party. For most people, a faucet is a channel to allow water to flow through and nothing more. Faucets are built to withstand frequent exposure to water and salts while enhancing the aesthetic beauty of your kitchen or bath. 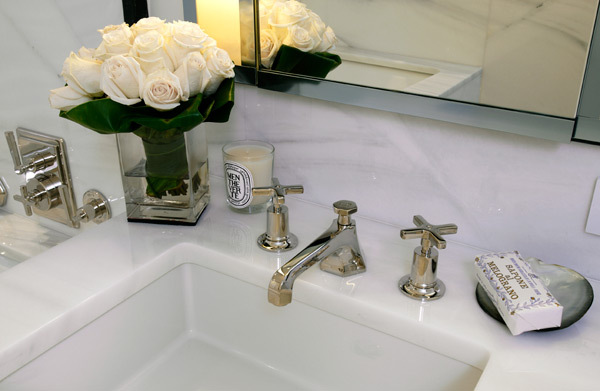 Choosing Zucchetti faucet will give your bathtub and vanity cabinets that exceptional look that no-one else has. Designer bathroom faucets like the Zucchetti brand come in many shapes and sizes and sturdy in design. They are stylish and modern and constructed of stainless steel and other metals that will endure over time. If you have a modern bathroom with a classical emphasis, then some of the flatbed faucets would really showcase your design. 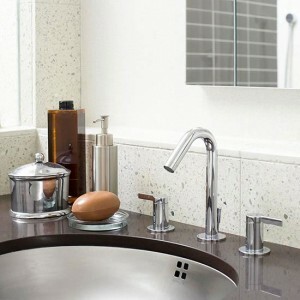 You can also add some faucets that have square or round design to them, to add a touch of contrast. The Zucchetti range of bathroom faucets includes many different shapes and sizes to suit all kinds of bathroom furniture and they are so easy to keep shiny and clean. A bathroom fixture should offer a perfect balance between design and functionality. A swivel motion in a bath faucet is much valued by those who like a good shave before rushing out to work. Bath faucets can be either standing or wall mounted. Zucchetti designs and molds these shapes to create some exceptional pieces almost like pieces of art that will update and upgrade your bathroom’s look to a high standard. Before rushing off to buy new faucets, check out how your bathroom’s plumbing works and what kind of fixtures and fitting will be needed for a good finish. Finally, investing in a good quality faucet backed by the manufacturer’s warranty, only goes to reinforce the confidence the manufacturer has in their product for years to come. Ten years ago, if you wanted to have a spa bath or a luxury bathroom fixture like a whirlpool, you would have to go down to the local healthclub or a sauna place. However due to innovation and advancements in technology, you can now have a whirlpool bath in your home. If you are thinking of changing your bathtub, then the Zuma Collection of ergonomically friendly bathtubs would be a good place to start. All of the materials used in the making of whirlpool and air bathroom tubs are designed to give the bather a relaxing and soothing bath to take away all the day’s stresses away. The size of your bathroom is important because you want to be able to get the right size bathroom fixtures for your space. Like with most things, each individual has personal preferences and the same applies to air bathtubs and whirlpool baths. These amazing bathtubs come in a varied selection of sizes and designs. Consider looking around PlumbTile.com for ideas on what options you have, and see which types of bathroom tubs from Zuma fit the space you want to take up. Take the spa to the next level, by being able to visit it every single day in your own home. Do you sense that your bathroom is outdated, well you’re not alone? Even in tough economic times, American families can change the whole look of their bathrooms by adding new plumbing and vanity fixtures and our Sonoma Forge fixtures review is here to help you out. Many homeowners ridicule the idea of changing their bathroom fixtures because it seems so insignificant. But once they have actually completed the process, the new hardware makes their entire bathroom look modern. And if the water was once a trickle in your taps, it could develop into a tidal wave with the addition of new Sonoma Forge fixtures. With the Sonoma Forge fixtures, a simple change of hardware on cabinets, shower units, bath taps, and even water pipes, can provide a complete makeover. Freshening up the paint may help as well to complement the new plumbing supply parts. Sonoma Forge has everything a customer could ask for. From Wingnut models to Sand Hands and everything in between, you are sure to find a unique look that quickly becomes a conversational piece for your guests. Sonoma Forge is able to bring the rugged appeal that most men prefer and harmoniously combine it with the delicate curves and refinement that women are attracted to. At last, a product that actually provides the best of both worlds. If you are replacing a faucet, then select something from the Sonoma Forge fixtures range as they are solid and very sturdy. If you have put up with years of a mere trickle of water coming out of your bath taps or showerheads, or even that the plumbing creaks and shakes, you are in for a really pleasant surprise. Once you have revamped your plumbing and vanity fixtures the water will come gushing out and you will be able to wash your hands or bathe as if you are in one of those posh hotel suites. It will definitely improve the quality of life for you and your family. When dealing with small bathroom vanities, you need to be able to make the most out of every inch they have available. There are a lot of things that need to be stored in a bathroom vanity, so if you happen to have a tiny one, it makes that option much more difficult. Coming up with some small bathroom designs that are apt to give you more storage can take some of the weight off of having a small vanity in your bathroom. Here are a few options you have to get the most out of your space. Coming up with small bathroom designs that involve a lot of storage can definitely help when your bathroom vanity is less than ideal for your needs. There are quite a few things that people often store in their bathroom vanity, such as a hairdryer, extra toilet tissue, bathroom cleaners, and sometimes even extra shampoos and body washes. You should also look into getting a bathroom medicine cabinet to hold all of your smaller items. Putting shelves into your small space can make your small bathroom vanity seem much larger as you won’t have to try and cram as much stuff into it. Take the time to figure out which things you need to keep in your bathroom, and figure out the best way of storing them within arms’ reach. Anything you don’t need at the ready in your bathroom should come out. Removing the excess ‘stuff’ from the room is part of what makes small bathroom designs so effective. Looking for extra ideas for ways around small bathroom vanities? Then look at PlumbTile.com and see what it is they have to offer. You can find new vanities if the storage solutions you seek aren’t realistic, or you can look around and figure out which storage options will best suit your space. Does a small bathroom sink make using your small bathroom more difficult? Is the sink a more realistic size for a child, or for someone that does not have a single bathroom accessory they need in the room? If your bathroom sink is short or the bowl of the sink is far too shallow, you may want to consider an entirely new bathroom fixture. However, if you are going that far, is that where you truly want to stop? If you are getting a new bathroom fixture, it may require you to have an entirely new bathroom vanity for it to fit properly. When it comes to maximizing the space in your small bathroom design, you need to be able to figure out where the important stuff is going to get stored, and keep those needs in mind when looking for the items to fill your room. 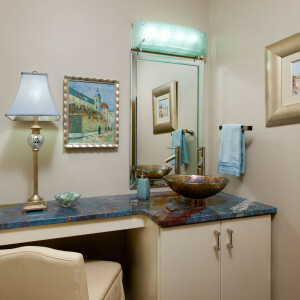 You should seek out a bathroom vanity with enough room to hold the right sized bathroom sink, but also enough room beneath it to be able to hold the things you need to store. Do you want to keep your extra rolls of toilet paper out of sight? Do you want to have your cleaning supplies out of the reach of little fingers? Then getting a solid bathroom vanity can be the perfect answer. If you are looking through different small bathroom designs and still coming up short with something that will clear up your small bathroom sink issue, then talk to the experts at PlumbTile.com. They are able to help you with options you may not have considered before, plus they can tell you which pages to look at to get a visual of what each item would look like. Make the most of your bathroom by adding in the right bathroom fixtures to fit your needs.